With the essential amino acids of moringa, you will enjoy the taste of this blend of moringa lemon tea when you feel down with your work pressure. Lemon peel can treat and prevent vitamin deficiencies, colds, flu, scurvy as well as digestive problems by stimulating the appetite. It also encourages the release of gastric juices to digest food. 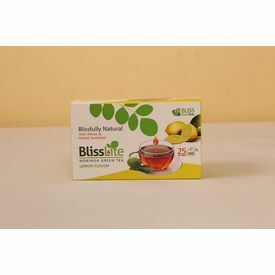 Bliss Lite Moringa Green Tea(Lemon Flavor) With Stevia - 25 Dip Bags With the essential amino acids of moringa, you will enjoy the taste of this blend of moringa lemon tea when you feel down with your work pressure. Lemon peel can treat and prevent vitamin deficiencies, colds, flu, scurvy as well as digestive problems by stimulating the appetite. It also encourages the release of gastric juices to digest food.